AllegroMedical.com presents The RockTape H2O Kinesiology Tape. RockTape is the world’s best kinesiology tape. It can be used to treat sports and non-sports injuries, including shin splints, plantar fasciitis, runner’s knee and back pain. RockTape microscopically lifts the skin away from the muscle and fascia below, which decompresses the area and promotes blood flow. Stretchier, stickier and stronger than the competition, RockTape is preferred by medical professionals throughout the world. H2O is our EXTRA sticky tape to give swimmers, triathletes, surfers, etc. piece of mind during aquatic training. It's also great for those extra sweaty training sessions on land. 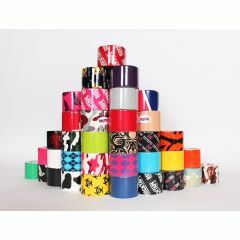 RockTape is made from 97% cotton and 3% nylon. The adhesive is a hypo-allergenic, acrylic-based and contains no latex. Big Daddy is the widest tape available on the market, perfect for applications that need extra coverage. Watch below how EASY RockTape is to apply! When applied properly, RockTape kinesiology tape microscopically lifts the skin away from the muscle and fascia below, increasing blood flow. Relieves swelling by creating more space for the congested and compressed capillaries, lymph vessels, arteries and veins. This results in faster removal of the by-products created by inflammation. Delays fatigue, speeding up recovery for rehab patients and enabling athletes to go stronger, longer. Cues form by increasing the patient or athlete’s awareness of their body position to help maintain proper alignment and form. Normalizes muscle tone by realigning the muscles that may be disrupted by injuries. When injured, we typically alter our movement to avoid pain, which can cause future discomfort or even further injury. Through tactical cueing, RockTape reminds you to maintain a good posture, allowing the injury to heal faster. First used by acupuncturists and chiropractors in Japan, today kinesiology tape is used by practitioners throughout the world to treat injuries and improve sports performance. While the use of kinesiology is often associated with athletes such as Michelle Wie, Adrian Peterson and Jason Khalipa, the reality is that RockTape is effective for the treatment of a wide variety of problems, not just sports injuries.